"I will insist that the Hebrews have done more to civilize man than any other nation." "Farther I could find it in my heart to wish that you had been at the head of a hundred thousand Israelites ... and marching with them into Judea and making a conquest of that country andrestoring your nation to the dominion of it. For I really wish the Jews again in Judea an independent nation. [I believe ... once restored to an independent government & no longer persecuted they [the Jews] would soon wear away some of the asperities and peculiarities of their character & possibly in time become liberal Unitarian christians for your Jehovah is our Jehovah & your God of Abraham Isaac and Jacob is our God.]" [I believe in the] rebuilding of Judea as an independent nation. Recalling the previous experiences of the colonists in applying the Mosaic Code to the order of their internal life, it is not to be wondered at that the various passages in the Bible that serve to undermine royal authority, stripping the Crown of its cloak of divinity, held up before the pioneer Americans the Hebrew Commonwealth as a model government. 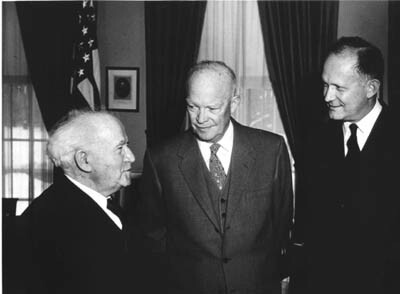 In the spirit and essence of our Constitution, the influence of the Hebrew Commonwealth was paramount in that it was not only the highest authority for the principle, “that rebellion to tyrants is obedience to God,” but also because it was in itself a divine precedent for a pure democracy, as distinguished from monarchy, aristocracy or any other form of government. It is impossible for one who has studied at all the services of the Hebrew people to avoid the faith that they will one day be restored to their historic national home and there enter on a new and yet greater phase of their contribution to the advance of humanity. I know the whole world acknowledges the fine spirit shown by the British Government in accepting the mandate of the Palestine in order that there might under this protection be established a homeland so long desired by the Jews. Great progress has been made in this inspiring enterprise over these last ten years, and to this progress the American Jews have made enormous contribution. They have demonstrated not only the fine sentiment and ideals which inspire their activities but its political possibilities. I am confident out of these tragic events will come greater security and greater safeguards for the future, under which the steady rehabilitation of the Palestine as a true homeland will be even more assured. I am interested to learn that a group of distinguished men and women is to be formed to spread knowledge and appreciation of the rehabilitation which is going forward in Palestine under Jewish auspices, and to add my expression to the sentiment among our people in favor of the realization of the age-old aspirations of the Jewish people for the restoration of their national homeland. I wish to express the hope that the ideal of the establishment of the National Jewish Home in Palestine, as embodied in that Declaration, will continue to prosper for the good of all the people inhabiting the Holy Land....I have watched with genuine admiration the steady and unmistakable Progress made in the rehabilitation of Palestine which, desolate for centuries, is now renewing its youth and vitality through the enthusiasm, hard work and self-sacrifice of the Jewish pioneers who toil there in a spirit of peace and social justice. It is very gratifying to note that many American Jews, Zionists as well as non-Zionists, have rendered such splendid service to this cause which merits the sympathy and moral encouragement of everyone. The American people, ever zealous in the cause of human freedom, have watched with sympathetic interest the effort of the Jews to renew in Palestine the ties of their ancient homeland and to reestablish Jewish culture in the place where for centuries it flourished and whence it was carried to the far corners of the world. This year marks the twentieth anniversary of the Balfour Declaration, the keystone of contemporary reconstruction activities in the Jewish homeland. Those two decades have witnessed a remarkable exemplification of the vitality and vision of the Jewish pioneers in Palestine. It should be a source of pride to Jewish citizens of the United States that they, too, have had a share in this great work of revival and restoration. (Greeting to the United Palestine Appeal, February 6, 1937). I have on numerous occasions, as you know, expressed my sympathy in the establishment of a National Home for the Jews in Palestine and, despite the set-backs caused by the disorders there during the last few years, I have been heartened by the progress which has been made and by the remarkable accomplishments of the Jewish settlers in that country. "I had faith in Israel before it was established, I have faith in it now." "This government has been informed that a Jewish state has been proclaimed in Palestine, and recognition has been requested by the provisional government thereof. 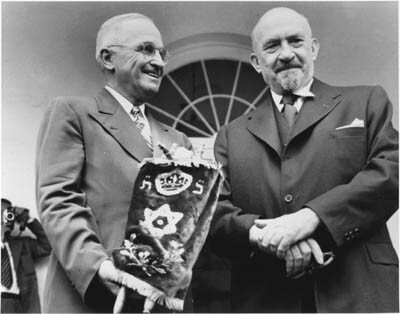 The United States recognizes the provisional government as the de facto authority of the new State of Israel." "I believe it has a glorious future before it - not just another sovereign nation, but as an embodiment of the great ideals of our civilization." "I had carefully read the Balfour Declaration. I had familiarized myself with the history of the question of a Jewish homeland and the position of the British and the Arabs. I was skeptical, as I read over the whole record up to date, about some of the views and attitudes assumed by the 'striped-pants boys' in the State Department." "I am proud of my part in the creation of this new state. Our Government was the first to recognize the State of Israel." "Our forces saved the remnant of the Jewish people of Europe for a new life and a new hope in the reborn land of Israel. Along with all men of good will, I salute the young state and wish it well." "The people of Israel, like those of the United States, are imbued with a religious faith and a sense of moral values"
"The teaching of their ancient belief is filled with truth for the present day. Its profound sense of justice, nation to nation, man to man, is an essential part of every religious and social order. The health of our society depends upon a deep and abiding respect for the basic commandments of the God of Israel." "Israel was not created in order to disappear—Israel will endure and flourish. It is the child of hope and home of the brave. It can neither be broken by adversity nor demoralized by success. It carries the shield of democracy and it honors the sword of freedom." "This nation, from the time of President Woodrow Wilson, has established and continued a tradition of friendship with Israel because we are committed to all free societies that seek a path to peace and honor individual right. We seek peace and prosperity for all of the Middle East firm in our belief that a new spirit of comity in that important part of the world would serve the highest aspirations and interests of all nations. In the prophetic spirit of Zionism all free men today look to a better world and in the experience of Zionism we know that it takes courage and perseverance and dedication to achieve it." "We support the security of both Israel and her neighbors." "[The United States and Israel] share many common objectives ... chief of which is the building of a better world in which every nation can develop its resources and develop them in freedom and peace." "Our society is illuminated by the spiritual insights of the Hebrew prophets. America and Israel have a common love of human freedom and they have a common faith in a democratic way of life ... Most if not all of you have very deep ties with the land and with the people of Israel, as I do, for my Christian faith sprang from yours .... the Bible stories are woven into my childhood memories as the gallant struggle of modern Jews to be free of persecution is also woven into our souls." "I may not worry as much as Prime Minister Eshkol does about Israel, but I worry as deeply." "The United States stands by its friends. Israel is one of its friends Peace can be based only on agreement between the parties and agreement can be achieved only through negotiations between them. The United States will not impose the terms of peace. The United States is prepared to supply military equipment necessary to support the efforts of friendly governments, like Israel's, to defend the safety of their people." "Americans admire a people who can scratch a desert and produce a garden. The Israelis have shown qualities that Americans identify with: guts, patriotism, idealism, a passion for freedom. I have seen it. I know. I believe that." "We have been through, over these years, some difficult times. During the period that I have served as President of the United States, we have been through some difficult times together, and I can only say that the friendship that we have for this nation, the respect and the admiration we have for the people of this nation, their courage, their tenacity, their firmness in the face of very great odds, is one that makes us proud to stand with Israel, as we have in the past in times of trouble, and now to work with Israel in a better time, a time that we trust will be a time of peace." "The United States ... has been proud of its association with the State of Israel. We shall continue to stand with Israel. We are committed to Israel's survival and security. The United States for a quarter of a century has had an excellent relationship with the State of Israel. We have cooperated in many, many fields -- in your security, in the well-being of the Middle East, and in leading what we all hope is a lasting peace throughout the world." 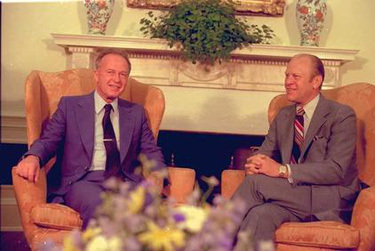 (Remarks Welcoming PM Rabin to USA, September 10, 1974). "America must and will pursue friendship with all nations. But, this will never be done at the expense of America's committment to Israel. A strong Israel is essential to a stable peace in the Middle East. Our committment to Israel will meet the test of American stead, fairness, and resolve. My administration will not be found wanting. The United States will continue to help Israel provide for her security. My dedication to Israel's future goes beyond its military needs to a far higher priority -- the need for peace. My commitment to the security and future of Israel is based upon basic morality as well as enlightened self-interest. Our role in supporting Israel honors our own heritage." "We have a special relationship with Israel. It's absolutely crucial that no one in our country or around the world ever doubt that our number one committment in the Middle East is to protect the right of Israel to exist, to exist permanently, and to exist in peace. It's a special relationship." "A few days ago in a conversation with about 30 members of the House of Representatives. I said that I would rather commit suicide than hurt Israel. I think many of them realize the two concepts are not incompatible. If I should ever hurt Israel, which I won't. I think political suicide would automatically result because it is not only our Jewish citizens who have this deep commitment to Israel, but there is an overwhelming support throughout the nation, because there is a common bond of commitment to the same principles of openness and freedom and democracy and strength and courage that ties us together in an irrevocable way." "We have a committment to the preservation of Israel as a nation, to the security of Israel, the right of the Israeli people, who have suffered so much, to live in peace that is absolutely permanent and unshakeable. The ties that bind the people of the United States and the people of Israel together, the ties of blood, kinship, ties of history, ties of common religious beliefs, the dream, centuries old, of the founding of the new nation of Israel have been realized. But the dream that the new nation of Israel should be guaranteed a right to live in peace has not yet been realized for its people and those who love Israel around the world ... Peace can come from a guarantee of security, and our staunch friendship for Israel will continue to be a major element in this foundation for progress." "The special relationship between the United States and Israel still stands. Our total committments to Israel's security and our hope for peace is still preeminent among all the other considerations that our Nation has in the Middle East ... But there need be no concern among the Israeli people nor among Jews in this country that our Nation has changed or turned away from Israel." "I would like to emphasize, in the strongest possible terms, that our aid for Israel is not only altruistic; indeed, our close relationship with Israel is in the moral and the strategic interest of the United States. There is a mutual relationship and there is a mutual benefit and there is a mutual committment, which has been impressed very deeply in my mind and also in the minds of the leaders of my Government and the Government of Israel. And I will continue to work with the leaders of Israel to strengthen even further our common commitments and our common goals. We know that in a time of crisis, we can count on Israel. 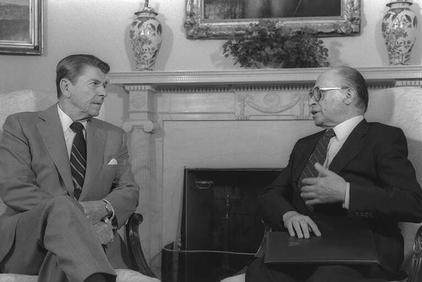 And the people of Israel know that in a time of crisis, they can count on the United States ... Let me assure you that in this negotiation, as we work for the legitimate rights of the Palestinians, recognized in the Camp David accords by Prime Minister Begin and President Sadat, that we will countenance no action whcih could hurt Israel's security. This is because of our commitment to Israel's security and well-being, and it's because Israel's security is so closely linked to the security of the United States of America ... I am opposed to an independent Palestinian state, because in my own judgement and in the judgement of many leaders in the Middle East, including Arab leaders, this would be a destabilizing factor in the Middle East and would certainly not serve the United States interests." "That concept offers a first real hope for keeping our common pledge -- a pledge made by all three of us -- to resolve the Palestinian problem in all its aspects while fully protecting the security and the future of Israel ... And we oppose the creation of an independent Palestinian state. The United States, as all of you know, has a warm and unique relationship of friendship with Israel that is morally right. It is compatible with our deepest religious convictions, and it is right in terms of America's own strategic interests. We are committed to Israel's security, prosperity, and future as a land that has so much to offer to the world. A strong Israel and a strong Egypt serve our own security interests ... We are committed to Israel's right to live in peace with all its neighbors, within secure and recognized borders, free from terrorism. We are committed to a Jerusalem that will forever remain undivided with free access to all faiths to the holy places. Nothing will deflect us from these fundamental principles and committments." The survival of Israel is not just a political issue, it is a moral imperative. That is my deeply held belief and it is the belief shared by the vast majority of the American people...A strong secure Israel is not just in Israel's interest. It's in the interest of the United States and in the interest of the entire free world. "Only by full appreciation of the critical role the State of Israel plays in our strategic calculus can we build the foundation for thwarting Moscow's designs on territories and resources vital to our security and our national well-being ... Since the rebirth of the State of Israel, there has been an ironclad bond between that democracy and this one ... In Israel, free men and women are every day demonstrating the power of courage and faith. Back in 1948 when Israel was founded, pundits claimed the new country could never survive. Today, no one questions that Israel is a land of stability and democracy in a region of tyranny and unrest ... America has never flinched from its commitment to the State of Israel--a commitment which remains unshakable." "I welcome this chance to further strengthen the unbreakable ties between the United States and Israel and to assure you of our commitment to Israel's security and well-being. Israel and America may be thousands of miles apart, but we are philosophical neighbors sharing a strong commitment to democracy and the rule of law. What we hold in common are the bonds of trust and friendship, qualities that in our eyes make Israel a great nation. No people have fought longer, struggled harder, or sacrificed more than yours in order to survive, to grow, and to live in freedom"
"Israel exists; it has a right to exist in peace behind secure and defensible borders; and it has a right to demand of its neighbors that they recognize those facts. I have personally followed and supported Israel's heroic struggle for survival, ever since the founding of the State of Israel 34 years ago. In the pre-1967 borders Israel was barely 10 miles wide at its narrowest point. The bulk of Israel's population lived within artillery range of hostile Arab armies. I am not about to ask Israel to live that way again." "Since the foundation of the State of Israel, the United States has stood by her and helped her to pursue security, peace, and economic growth. 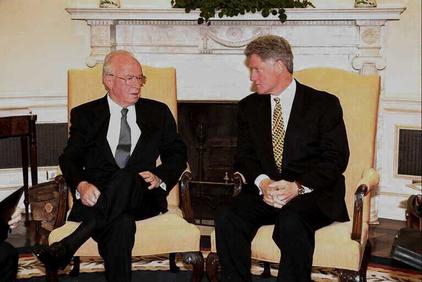 Our friendship is based on historic moral and strategic ties, as well as our shared dedication to democracy." "For the people of Israel and America are historic partners in the global quest for human dignity and freedom. We will always remain at each other's side." "The meetings with the Presidents of Egypt and Israel and with the King of Jordan form part of a larger effort to bring peace to the Middle East. And I made clear the continuing readiness of the United States to facilitate this effort in a manner that's consistent with the security of Israel and the security of our Arab friends in the region as well." 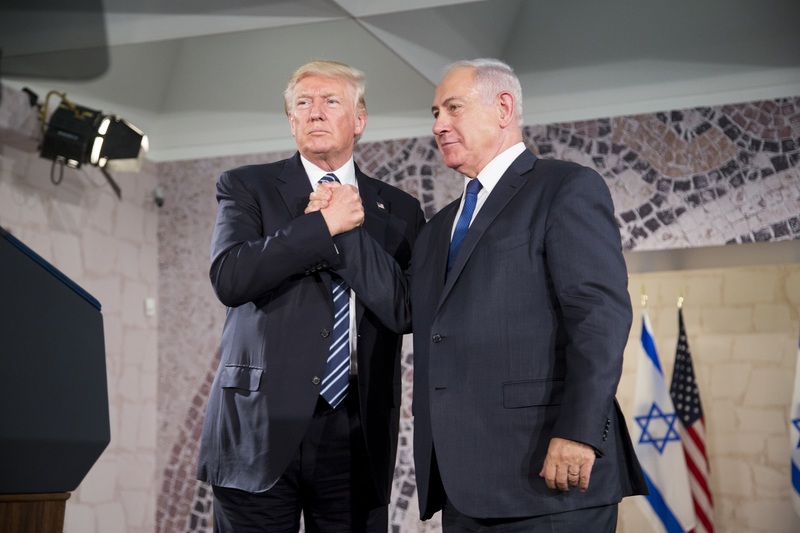 "The friendship, the alliance between the United States and Israel is strong and solid -- built upon a foundation of shared democratic values, of shared history and heritage that sustain the moral life of our two countries. The emotional bond of our peoples goes -- it transcends politics. Our strategic cooperation -- and I renewed today our determination that that go forward -- is a source of mutual security. And the United States' commitment to the security of Israel remains unshakable. We may differ over some policies from time to time, individual policies, but never over this principle." "We also share a profound desire for a lasting peace in the Middle East. My Administration is dedicated to achieving this goal, one which will guarantee Israel security. At the same time, we will do our utmost to defend and protect Israel, for unless Israel is strong and secure, then peace will always be beyond our grasp. 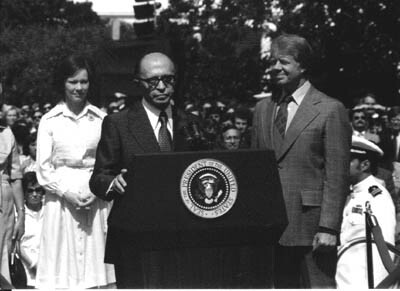 We were with Israel at the beginning, 41 years ago. We are with Israel today. And we will be with Israel in the future. No one should doubt this basic committment." "The friendship, the alliance between the United States and Israel is strong and solid, built upon a foundation of shared democratic values, of shared history and heritage, that sustains the life of our two countries. The emotional bond of our people transcends politics. Our strategic cooperation—and I renew today our determination that that go forward—is a source of mutual security. And the United States’ commitment to the security of Israel remains unshakeable. 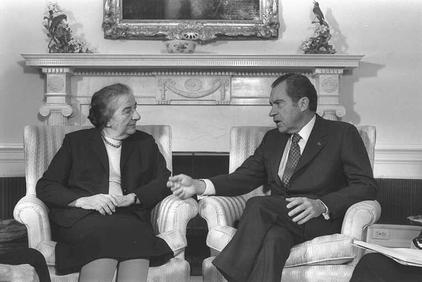 We may differ over some policies from time to time, individual policies, but never over the principle ... For more than 40 years, the United States and Israel have enjoyed a friendship built on mutual respect and commitment to democratic principles. Our continuing search for peace in the Middle East begins with a recognition that the ties uniting our two countries can never be broken ... Zionism is the idea that led to the creation of a home for the Jewish people....And to equate Zionism with the intolerable sin of racism is to twist history and forget the terrible plight of Jews in World War II and indeed throughout history." "Israel's democracy is the bedrock on which our relationship stands. It's a shining example for people around the world who are on the frontline of the struggle for democracy in their own lands. Our relationship is also based on our common interest in a more stable and peaceful Middle East, a Middle East that will finally accord Israel the recognition and acceptance that its people have yearned for so long and have been too long denied, a Middle East that will know greater democracy for all its peoples ... I believe strongly in the benefit to American interests from strengthened relationships with Israel. Our talks today have been conducted in that context. We have begun a dialog intended to raise our relationship to a new level of strategic partnership, partners in the pursuit of peace, partners in the pursuit of security." "Our relationship would never vary from its allegiance to the shared values, the shared religious heritage, the shared democratic politics which have made the relationship between the United States and Israel a special—even on occasion a wonderful—relationship ... The United States admires Israel for all that it has overcome and for all that it has accomplished. We are proud of the strong bond we have forged with Israel, based on our shared values and ideals. That unique relationship will endure just as Israel has endured." "America and Israel share a special bond. Our relations are unique among all nations. Like America, Israel is a strong democracy, as a symbol of freedom, and an oasis of liberty, a home to the oppressed and persecuted ... The relationship between our two countries is built on shared understandings and values. Our peoples continue to enjoy the fruits of our excellent economic and cultural cooperation as we prepare to enter the twenty-first century." "We will speak up for our principles and we will stand up for our friends in the world. And one of our most important friends is the State of Israel ... Israel is a small country that has lived under threat throughout its existence. At the first meeting of my National Security Council, I told them a top foreign policy priority is the safety and security of Israel. My Administration will be steadfast in supporting Israel against terrorism and violence, and in seeking the peace for which all Israelis pray." "Through centuries of struggle, Jews across the world have been witnesses not only against the crimes of men, but for faith in God, and God alone. Theirs is a story of defiance in oppression and patience in tribulation — reaching back to the exodus and their exile into the diaspora. That story continued in the founding of the State of Israel. The story continues in the defense of the State of Israel." 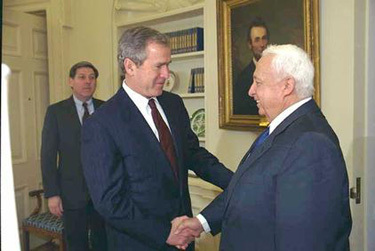 "For more than a generation, the United States and Israel have been steadfast allies. Our nations are bound by our shared values and a strong commitment to freedom. These ties that have made us natural allies will never be broken. Israel and the United States share a common history: We are both nations born of struggle and sacrifice. We are both founded by immigrants escaping religious persecution in other lands. Through the labors and strides of generations, we have both built vibrant democracies, founded in the rule of law and market economies. And we are both countries established with certain basic beliefs: that God watches over the affairs of men and values every human life." "[Israel] is our ally and in that we've made a very strong commitment to support Israel, we will support Israel if her security is threatened." "Our two nations have a lot in common, when you think about it. We were both founded by immigrants escaping religious persecution in other lands. 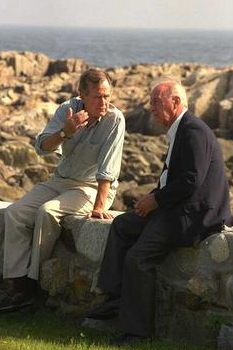 We both have built vibrant democracies. Both our countries are founded on certain basic beliefs, that there is an Almighty God who watches over the affairs of men and values every life. These ties have made us natural allies, and these ties will never be broken." "The threat from Iran is, of course, their stated objective to destroy our strong ally Israel. That's a threat, a serious threat. It's a threat to world peace; it's a threat, in essence, to a strong alliance. I made it clear, I'll make it clear again, that we will use military might to protect our ally, Israel." "America's commitment to Israel's security is unshakeable, and our friendship with Israel is deep and enduring. And so we believe that any lasting peace must acknowledge the very real security concerns that Israel faces every single day ... The Jewish people have forged a successful state in their historic homeland. Israel deserves recognition. It deserves normal relations with its neighbors. And friends of the Palestinians do them no favors by ignoring this truth, just as friends of Israel must recognize the need to pursue a two state solution with a secure Israel next to an independent Palestine." "[America] will stand steadfast with Israel in pursuit of security and a lasting peace." "I care deeply about preserving that Jewish democracy, because when I think about how I came to know Israel, it was based on images of kibbutzim, and Moshe Dayan, and Golda Meir, and the sense that not only are we creating a safe Jewish homeland, but also we are remaking the world. We’re repairing it. We are going to do it the right way." "Precisely because I care so deeply about the State of Israel, precisely because I care so much about the Jewish people, I feel obliged to speak honestly and truthfully about what I think will be most likely to lead to long-term security, and will best position us to continue to combat anti-Semitism, and I make no apologies for that precisely because I am secure and confident about how deeply I care about Israel and the Jewish people." 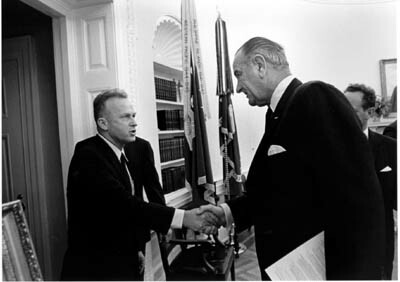 "I think it would be a moral failing for me as president of the United States, and a moral failing for America, and a moral failing for the world, if we did not protect Israel and stand up for its right to exist, because that would negate not just the history of the 20th century, it would negate the history of the past millennium"
"To me, being pro-Israel and pro-Jewish is part and parcel with the values that I've been fighting for since I started getting involved in politics. There’s a direct line between supporting the right of the Jewish people to have a homeland and to feel safe and free of discrimination and persecution, and the right of African Americans to vote and have equal protection under the law. These things are indivisible in my mind."